One of CodeClub’s sponsors is Orion Health so I had been looking for some reasonably priced sensors for health focused projects. We already use the SeeedStudio Heart rate sensor for one of our projects so I ordered a Grove EMG Detector for evaluation. The EMG detector outputs a single analog signal which we connected to analog input 0. For the proof of concept we averaged for 500 samples to determine the steady state offset. The proof of concept worked surprisingly well, the LED illuminated on the LED bar appeared to move in response to arm movements and when I clenched my fist. 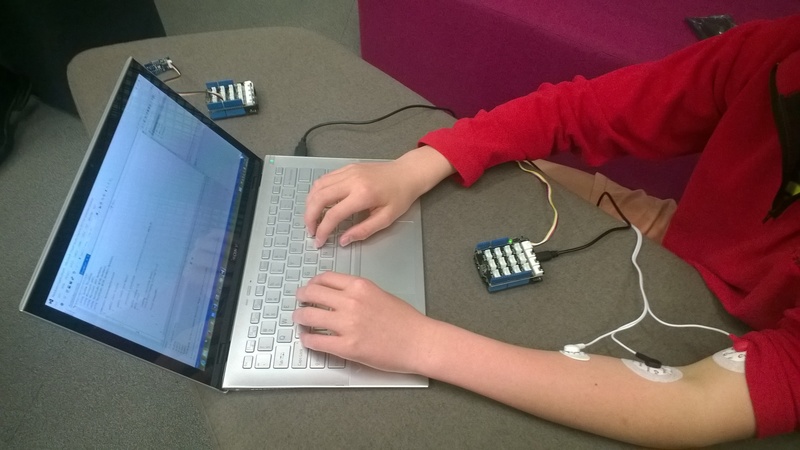 This entry was posted in .NetMF, CodeClub, SeeedStudio, Sensors and tagged Analog input, CodeClub, Electromyograph, EMG, Netduino, NetMF, seeedstudio. Bookmark the permalink.